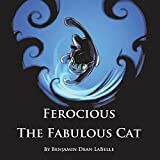 Ferocious the Fabulous Cat is a whimsical tale about a cat that protects her precious family. Follow Ferocious' journey, from meeting her human, watching her family grow, playing and getting into trouble. The vibrant art paired with an engaging and fun story will keep you turning pages just to see what Ferocious is up to next. Ben LaBelle, author of Fabulous Ferocious the Cat, lives in Lacey Washington with his lovely wife and two amazing children. Ben was motivated by his family to write this book to provide a everlasting memory of their beloved family cat, Ferocious. He strives to write books that can be shared by parents and children. Ben is well-rounded and active in his community. He has been instructing a children's martial arts class (Danzan Ryu Jujutsu) at the local YMCA since 2010. Ben plans to write additional short story books to share with his family and readers of all ages.